Has OYO's rapid growth locked out competition from FabHotels and Treebo? OYO is by far the best-funded startup in the space. Since setting up shop in 2013, its parent Oravel Stays Pvt. Ltd has received nearly $450 million (around Rs 3,000 crore) in investment from marquee investors such as Japan's SoftBank and venture capital firm Sequoia Capital. In comparison, Treebo and FabHotels have raised less than $100 million between them despite funding from prominent investors such as Accel Partners, SAIF Partners and Goldman Sachs. Generous funding aside, it's the financial year 2016-17 that may have been a turning point for OYO. The Ritesh Agarwal-led venture's revenue grew more than seven times to Rs 125.3 crore in that fiscal, leaving its less-funded rivals in the shade. Although Treebo and FabHotels, which target the same customer segment, increased their revenues, they managed considerably lower growth compared to OYO. FabHotels, in fact, had recorded a higher operational revenue than OYO in the financial year 2015-16. A common factor was that expenses grew exponentially. Losses widened for Treebo and FabHotels and though OYO managed to reduce its losses, the figure still remained alarmingly high. "The RoC [Registrar of Companies] numbers are dated and come with such a lag," said Treebo co-founder Sidharth Gupta. "It is not the right metric for me to comment. There is no standardisation on how each of the players mark their revenues." FabHotels did not comment on this story. OYO chief executive Ritesh Agarwal told TechCircle in an emailed statement that the company's provisional revenue for 2017-18 stood at Rs 423.2 crore, which would represent more than a three-fold growth. However, all three firms are yet to formally report their financials for 2017-18, which once available will provide a more accurate picture. The question now is whether OYO is too far ahead of the pack and whether FabHotels and Treebo can catch up. OYO was founded in 2013, FabHotels in 2014, and Treebo a year later. Gaurav Karnik, partner for real estate and hospitality at consultancy firm EY, said these firms kept commissions low in the early days to attract good properties and landlords. The strategy seemed to work, as they achieved considerable scale within three or four years. FabHotels and Treebo ran on a full inventory model from the get-go by taking complete charge of hotels' operations by deciding everything from the linen fabric to the shade of paint. OYO did things a bit differently. It started with the full inventory model before switching to the partial inventory model in an effort to scale up. The startup aggregated hotel rooms under the OYO brand and blocked a few rooms in partner hotels. Under this model, OYO had around 70,000 rooms under its umbrella in just three years. But after a slew of irregularities and malpractices by hotel partners, OYO chose instead to consolidate its operations under the franchise model. Since early 2016, it has been controlling the inventory and deciding pricing along with its exclusive hotel partners - a strategy which likely contributed to its stellar growth in 2016-17. "In the early days, they [all three players] tried to be both an aggregator and budget hotel brand and had to compete with players on both sides. Subsidising and heavy marketing drove their losses to unsustainable levels," said a senior executive with a leading OTA player. "Since then, they have all cut down losses as a percentage of their revenue. They have focussed less on growth as there are only three players." Treebo co-founder Sidharth Gupta had told TechCircle last year that occupancy and revenue would rise only if hotel chains focused on customer experience. 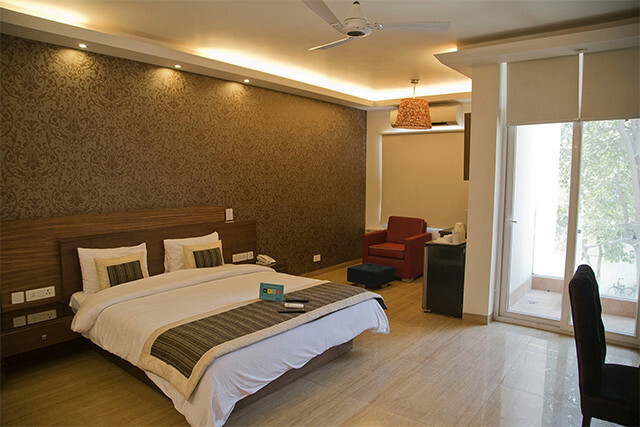 For its part, FabHotels has the best expense-to-sales ratio and glowing reviews on portals for its offerings. But while both chains may have been right about the full inventory model and the focus on customer satisication, OYO remains well ahead of the pack. The Gurgaon-based venture plans to more than double its room count to 1.8 lakh by the end of this year. In comparison, Treebo and FabHotels had only 10,000 and 7,000 rooms respectively at last count. In addition, there may be some more good news for OYO. Earlier this month, The Economic Times reported that leading online travel player MakeMyTrip may buy a stake in OYO. The duo had struck a partnership in February whereby OYO would list its hotels on platforms run by MakeMyTrip, more than two years after being blocked by the Nasdaq-listed company. And Treebo confirmed to TechCircle that MakeMyTrip had recently given it a month's notice to delist its hotels. “If the MMT-Ibibo-OYO deal happens, it will be a big setback for FabHotels and Treebo," said Satish Meena, senior forecast analyst at consultancy firm Forrester Research. "If they are excluded from the platform, their losses will widen. They will have to acquire customers at much higher cost by driving them to their own website or other OTAs." In such a scenario, is consolidation a possibility? Meena believes that each player can exist indepenently. Treebo's Gupta agrees. "There were multiple players two years ago but fell by the wayside. But if we look at hotel brands, there is space for multiple brands," he said. "The only differentiator is our own experience and the extent of competition only has a limited effect on how well we do." OYO's Agarwal feels the market is still up for grabs. "With 4 million unbranded rooms in the market – implying a market share of 1.8%, we still have a long way to go," he said. The leader in the segment is obvious but all three players still have their work cut out. “These hotels still face a lot of challenges that includes a lot of investments in physical infrastructure at these hotels to standardise according to customer expectations,” said a senior executive with a leading OTA player, who did not wish to be identified. The good news is that the demand clearly exists. RedSeer, an internet consultancy, told TechCircle that the total gross booking value of the three hotel-tech players increased to Rs 700 crore during the last quarter of the calendar year 2017 from Rs 380 crore in the three-month period before that. The focus on improving customer experience is also paying dividends in the larger market. RedSeer estimates consumer net promoter score (NPS) — a metric for customer loyalty — improved to 13% during the last quarter of 2017 from -3% in the first quarter, largely down to the fact that brands took full control of inventory. "Around 65% of customers who book with us are repeat customers – implying adherence to our brand and an indication of our service quality," said OYO's Agarwal.